The Shapeways package sat on a fencepost. It was too big to fit in the mailbox and hadn’t made it to the porch because of the dogs. They’re very loud and big for English Springer Spaniels, their presumptive (and undoubtedly nonexclusive) breed. Either or both dogs are more than enough to dissuade entry into the yard when they’re outside. So the box sat on the fence for a little while, until I noticed that the dogs had been barking at a person in our yard, as opposed to a person walking a dog, or a car driving down the street, or invisible space monsters lurking in the trees. Once aware of the box, I had a pretty good idea of its contents. I didn’t have any outstanding orders from elsewhere and didn’t think my husband did, either. So the box held the last item I needed to finish writing my highly attenuated thesis. Never mind that I still had some archival research to pursue. I could visit Haverford College any time. I am quite aware that archival records are not static—I process collections, and at Haverford would encounter evidence that collections are works in progress—but reading letters nonetheless seemed to be no more than a scheduling issue. Receiving a physical object seemed a more significant milestone. I had ordered not merely its delivery, but its creation. So the box came inside and sat on the kitchen counter for a time. I was busy; I was nervous; I was uncertain what degree of ceremony was called for. I very much wanted a good object, but at the same time I knew the quality of the object was a secondary concern. It existed. That was enough. I sliced the box’s tape with a steak knife. It’s an old knife, with a cheap black plastic handle. The rest of the set disappeared over the years. This one is only occasionally used at mealtime, but has instead become almost my default tool for opening boxes and removing tags. The scissors never seem to be where they’re supposed to be, but the steak knife always makes it back into the silverware drawer. The space within the box is almost entirely filled with packaging material. No packing peanuts, for which I am grateful: now that I am a grown up, responsible for picking up scattered bits of Styrofoam, I despise the things. Nor is it bubble wrap: a little more disappointing, because I am not sufficiently grown up to have lost my taste for popping the bubbles. Instead, a sheet of air cushions are wrapped around a white object, distorting my view of it. I opted against complete documentation of the unboxing process, but I cannot resist taking a picture with my smartphone. (See Photograph 1.) Then I stab the air cushion—carefully, because I do not want to hurt my object, but nor can I resist the destructive impulse. It lacks the unmediated pleasure of popping bubble wrap, the feel of a finger nestling comfortably into the depression left behind by displaced air, but it will do. And deflating the cushions does have a practical effect: the deflated cushions will take up less space in the recycling. A cardboard box. A steak knife. Packing material. A yard with a fence and domesticated animals. The economic and technological systems that allow me to supply a digital file to a company in New York and receive a printed object in a matter of days. These are material markers of my life, revealing despite—or perhaps because—they are so routine as to be invisible. A similarly routine object was my point of entry into an earlier era, and the reason for the new object’s existence. Knifework finished for the moment, I unwound the plastic and began shaping my final chapter. Photograph 1. 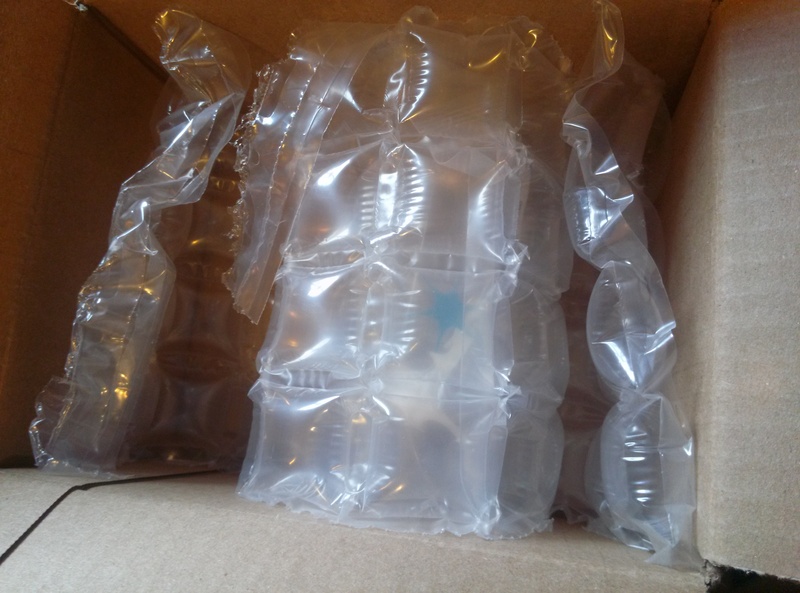 3D printed object wrapped in air cushions for shipping. I approach this project from the perspective of an archivist—more specifically, an archivist who views her professional duties as public history, and more broadly identifies as a historian. This is by no means a universal conception of the profession, but it infuses the way I perceive institutions, interact with historical sources, and interpret collections. “Archives” is a contested term. The Society of American Archivists offers a professional definition.1 Scholars in various fields deploy the term and also debate its implications. Professionals in different fields use the term. The broader public has an understanding of the term that need not rise to the level of term of art, but still has meaning. These competing understandings can never be fully resolved—which is not a bad thing, as continued debate reflects the underlying relevance of archives—but they do serve to illuminate the conceptions, desires, and needs of the individuals who create archives and those who use them. In less formal contexts, academics and professionals actively discuss the meaning of archives—both the word and the material to which it refers. The use of Twitter at conferences offers a glimpse into these conversations, as well as the opportunity to expand them beyond the attendees. One observation about the nature of archives—“Just want to remind everybody that the Beinecke holds Carl Van Vechten’s porcelain cat collection”—bears the hashtag of a data-related session at the Modern Language Association’s 2014 convention.2 Following discussions at academic conferences—or professional conferences more directly related to the field of archives—yields similar pithy statements but also links to more substantive articles and bibliographies.3 The conversations—or perhaps conversation, given the ease with which questions and responses can cross disciplines (some of which are interdisciplinary by nature)—reveals a strong interest in grappling with the meaning of archives. Archivists routinely work with a variety of materials. Unbound words-on-paper may leap to mind as the primary, most common, and most venerable of archived material, but archives also hold graphical, audio, video, bound volumes, born-digital, and digitized material. Theimer points out that formal definitions of archives are inclusive and require no expansion to incorporate digital materials.5 Schellenberg’s writings emerged from the mechanically-enabled avalanche of paper documents filling government archives, but his definition of “record” was agnostic as to format.6 If a photograph is as much a record as a memo, why not a porcelain cat? Yet archives often give short shrift to material culture, despite the inclusiveness of archival theory. Jim Burant argues that ephemera should be treated in the same way as more traditional documents. The materials to which he refers are transitory, often printed text: tickets, advertisements, postcards. Vibrant personal collections and markets for such material attest to public interest. He details archivists’ lack of attention to ephemera in literature, its haphazard acquisition, and inadequate intellectual control.7 Inclusion of this article in my review of the literature, rather than one of more recent vintage, speaks to the way in which this type of material remains sidelined. The problem can be worse for nontextual artifacts, which may also present challenges to physical control. Burant’s postcards can fit in a Hollinger box. Other materials require additional care, different housing, or creative description. Henry Muhlenberg pressed plant samples in some of his botanical notebooks. Though secure between the pages for over two centuries, a conservator’s care and rehousing is advisable, and in this case separating the materials might increase their visibility. A reader of Monographia plantarum Lancastriensis may well have more interest in botanical descriptions and local names, but the presence of samples could speak to Muhlenberg’s priorities or process.8 Textual Haines family ephemera—including newspaper clippings and postcards—remain foldered with the collection, but an apron pocket and war victims’ badge were separated.9 The Friends Historical Library holds such artifacts as a spinning jenny, bonnets, and hat boxes, but as they are not the primary focus of the Library, their description is least detailed.10 High profile, frequently accessed collections are likely to be most carefully processed, with finding aids most readily available online. Researchers may be delighted to stumble upon rogue pieces of material culture, but may not even know to ask whether they are available. Such oddities can lapse into invisibility. This is a problem because material culture is culture. Furthermore, it is a form of culture that can document the lives of non-elite members of society, as James Deetz notably illustrated with In Small Things Forgotten.11 One of the most cutting critiques of archives is the tendency to reinforce existing power structures. Members of the profession are aware of this, and the potential to distort the historical record and enable unjust treatment of individuals and groups. Strategies suggested for combating the problem include the implementation of collection policies targeting underrepresented groups.12 By paying more attention to material culture—the non-textual artifacts that could be collected, or may already exist within collections—archivists can help give a voice to the traditionally marginalized and build a more complete and useful historical record. I have drawn on the work of academics in various disciplines—not simply history—including American studies, history of art, cultural and information studies. In modeling a course of study and then applying it to a specific artifact, I follow Fleming.13 By emphasizing a modular approach to inquiry and the re-evaluation of an artifact, I follow Schlereth.14 My object analysis methodology largely follows Prown.15 The archival theory which informs my writing is professional in nature, as well as theoretical. My pedagogical argument touches upon information studies, behavioral economics, psychology, and the digital humanities, as well as the practical experience of individuals working in the field. I have embraced an interdisciplinary approach. Historians open to the practices and findings of other disciplines can access a wealth of information about the past. Public history is fundamentally an interdisciplinary and collaborative endeavor. Archival theory and practice draw from related disciplines, particularly library science, information technology, and museum studies. Digital humanities is a dynamic endeavor (albeit ill-defined, in many traditional senses) that offers the tools to approach existing sources in a new way. Advancing digitization and materialization as a digital humanities project is at once obvious and disruptive. The “spatial turn” emphasizes mapping and other visual representations of data. Elliott et al warn that computational text analysis may reinforce historians’ textual bias. This project, like Elliott’s exploration of the material culture of stage magic and the history of the senses, casts material culture and public history within the digital humanities.16 It also drags archives under the same umbrella. Archival literature is concerned with all manner of things digital—data migration, bit preservation, born-digital records, authentication, digitization—but largely ignores subsequent materialization, to say nothing of the three-dimensional artifacts that have found their way into collections. Making replicas of artifacts is nothing new. There is a long history of their display within repositories and sale as souvenirs. Plaster casts and photocopies have been replaced by 3D models and .jpgs. Printing those 3D models is not so different than printing the .jpgs: the utility of the practice is determined by the end goal and available technology. I wish to focus upon the benefits of digitization and materialization projects within small institutions. I will not examine large institutions. Comparatively well-endowed and -staffed, with high profile collections capable of attracting the attention of partners and grant-givers, they are in a good position to engage in large-scale digitization projects. Such institutions have space in their budget for project staff and capital investments. The Smithsonian, for instance, has identified 10% of its holdings as priorities for digitization.17 While exciting, that sort of initiative is not immediately relevant to the daily operations of a repository with a tiny staff and a paper-based catalog. Small institutions rely upon a core of dedicated staff members and the contributions of local communities and other stakeholders. The nature of the mission and collections of smaller institutions often means professional lines are blurred at an individual, not merely institutional, level. The smaller the institution—whether dubbed “archive,” “library,” or “museum”—the more likely staff must be flexible and cross-trained. And while the staff is also more likely to be overworked and under budgetary pressure, a 3D modeling project can be undertaken cheaply and accomplish such fundamental goals as community outreach and education. In Chapter 2, I will discuss the pedagogical and emotional value of physical interaction with objects. I will also discuss disciplines and rubrics, particularly as they apply to the work of public historians, and define several publics that can participate in the digitization and materialization projects I describe. In Chapter 3, I will propose strategies for bringing the public into repositories to encounter and interact with artifacts—and technology—in unexpected ways. I have adopted modular approaches which may be used individually or in combination to more thoroughly interrogate an object. In Chapter 4, I will employ object analysis methodology to investigate a particular object. My engagement with the physical object will be supplemented by historical research, and the choice of object provides an opening to explore such topics as gender roles, the significance of toys and childhood play, and the nature of housework. In Chapter 5, I will discuss the technical process of digitizing and materializing the artifact. As human interaction with technology is an important part of my analysis, this chapter takes the form of a reflexive project narrative. In Chapter 6, I return to object analysis, this time analyzing the plastic printed object. My involvement in the creation of the object underlines the subjectivity of the enterprise.